The Westin Hotel is the centerpiece of the 12-acre mixed-use Park Place development in the heart of Annapolis, Md. FORT WORTH, TEXAS, US, April 4, 2018 /EINPresswire.com/ -- Crescent Real Estate LLC (Crescent) purchased the Westin Annapolis, a 225-room hotel located in the 12-acre mixed-use Park Place development in the heart of Annapolis, Md. Completed in 2007, the Westin Annapolis remains the market’s newest full-service hotel and is only a short walk to the Maryland State House and Annapolis waterfront. The hotel is the centerpiece of the mixed-use development which also includes two five-story office buildings, 60,000 square feet of upscale boutique retail and restaurants, and a seven-story, 208-unit luxury residential tower. 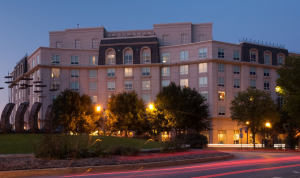 The six-story mid-rise hotel has 19,000 square feet of meeting space, including the 6,350-square foot Capitol Ballroom, the largest event space in the Annapolis market providing the Westin Annapolis with a competitive advantage in hosting large groups and social events. Additionally, the Westin Annapolis amenities include the Azure Restaurant and Bar, an indoor pool, WestinWORKOUT fitness center, and complimentary Westin bicycles popular with tourists visiting one of the nation’s most historic towns. Memorial Stadium, as well as the majority of office space in the Annapolis submarket. “The purchase of the Westin Annapolis represents a rare opportunity to acquire a modern, quality asset with stable demand created by the presence of state government, the United States Naval Academy, and local office market. Additionally, Annapolis has a reputation as one of the premier drive-to leisure destinations in the Mid-Atlantic,” said Jason Anderson, Co-CEO of Crescent. Crescent has engaged HEI Hotels, a nationally recognized hotel management firm with extensive experience managing more than a dozen Westin brand hotels. Crescent used its investment fund, GP Invitation Fund I, established in 2016, to purchase the Westin Annapolis hotel. The Washington, D.C.-Maryland-Virginia MSA (Washington MSA) consistently ranks in the top lodging markets in the U.S. More than 4 million tourists visit Annapolis each year to walk the city’s historic downtown and panoramic views of the Chesapeake Bay. “The Washington MSA lodging market, and Annapolis specifically, is a robust market with a positive outlook with room occupancy and room rates well above the U.S. average. Annapolis’ diverse and growing economy, along with being located within a 3-hour drive of more than 18.6 million residents, makes the purchase of the Westin Annapolis hotel an exciting investment for Crescent Real Estate,” added Anderson. Although Crescent has not announced capital investment for the hotel, the company plans to enhance the hotel experience with upgrades to guest rooms, the restaurant and bar, pool and common areas. Crescent Real Estate LLC (Crescent) is a real estate operating company and investment advisor, founded by Chairman John C. Goff, with assets under management and investment capacity of more than $4 billion. Through the recently established GP Invitation Fund I, the company acquires, develops and operates all real estate asset classes alongside institutional investors and high net worth clients. Crescent’s premier real estate portfolio consists of Class A and creative office, multifamily and hospitality assets located throughout the U.S. including The Ritz-Carlton, Dallas; McKinney & Olive in Dallas; and the wellness lifestyle leader, Canyon Ranch®. For more information visit crescent.com.